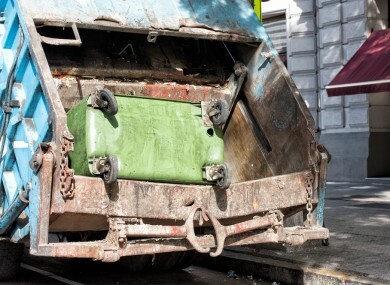 POLICE SAY A homeless man who was sleeping inside a bin survived two compaction cycles after the bin was emptied into a rubbish truck. Geneva Bosques, a spokesperson for Fremont Police Department in California, said a 44-year-old man was sleeping inside a large bin behind a restaurant when a rubbish truck collected it and used the compactor. Bosques told local newspaper the Oakland Tribune the truck then travelled to a fast food restaurant, collected rubbish from another bin there and again used the compactor. She said the man crawled out through an opening in the roof the next time the truck stopped. “He was very lucky to have survived the compaction and get out of the truck safely,” Bosques stated. The man was not named as he suffers from mental health issues. He was placed on a psychiatric hold at a hospital. Police said he has outstanding warrants, but the nature of these were not released. Email “Homeless man 'lucky to be alive' after being thrown into rubbish truck”. Feedback on “Homeless man 'lucky to be alive' after being thrown into rubbish truck”.